Nothing has ever taken Cayo Vila by surprise—until now. And the word “no” just isn’t part of his vocabulary. So a resignation from the best PA he’s ever had is simply unacceptable. Dru’s heard all about his legendary charm, but now that it’s turned on her she understands exactly why it’s so hard to say no to Cayo Vila! 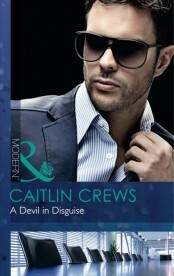 Follow Caitlin's A Devil in Disguise board on Pinterest. "Of course you are not resigning your position," Cayo Vila said impatiently,not even glancing up from the wide expanse of the granite and steel desk that loomed in front of the glorious floor-to-ceiling view over a gleaming wet stretch of the City of London, not that he had ever been observed enjoying it. The working theory was that he simply liked knowing that it was widely desired by others, that this pleased him more than the view itself. That was what Cayo Vila loved above all else, after all: owning things others coveted. It gave Drusilla Bennett tremendous satisfaction that she would no longer be one of them. He made a low, scoffing sound. "Don't be dramatic." Dru forced herself to smile at the man who had dominated every aspect of her life, waking and sleeping and everything in between, for the past five years. Night and day. Across all time zones and into every little corner of the globe where his vast empire extended. She'd been at his beck and call around the clock as his personal assistant, dealing with anything and everything he needed handled, from a variety of his personal needs to the vagaries of his wide-ranging business concerns. And she hated him. Oh, how she hated him. She did. It surged in her, thick and hot and black and deep, making her skin seem to shimmer over her bones with the force of it. It was hard to imagine, now, knowing the truth, that she'd harbored softer feelings for this man for so long—but it didn't matter, she told herself sternly. It was all gone now. Of course it was. He'd seen to that, hadn't he? She felt a fierce rush of that hard sort of grief that had flooded her at the strangest times in these odd few months since her twin brother Dominic had died. Life, she had come to understand all too keenly, was intense and often far too complicated to bear, but she'd soldiered on anyway. What choice was there? She'd been the only one left to handle Dominic's disease—his addictions. His care. His mountain of medical bills, the last of which she'd finally paid in full this week. And she'd been the only one left to sort through the complexities of his death, his cremation, his sad end. That had been hard. It still was. But this? This was simple. This was the end of her treating herself as the person who mattered least in her life. Dru was doing her best to ignore the swirling sense of humiliation that went along with what she'd discovered in the files this morning. She assured herself that she would have resigned anyway, eventually; soon—that finding out what Cayo had done was only a secondary reason to leave his employ. "This is my notice," she said calmly, in that serene and unflappable professional voice that was second nature to her—and that she resolved she would never again utilize the moment she stepped out of this office building and walked away from this man. She would cast aside the necessarily icy exterior that had seen her through these years, that had protected her from herself as well as from him. She would be as chaotic and emotional and yes, dramatic as she wished, whenever she wished. She would be flappable unto her very bones. She could already feel that shell she'd wrapped around her for so long begin to crack. "Effective immediately." Slowly, incredulously, a kind of menace and that disconcerting pulse of power that was uniquely his emanating from him like a new kind of electricity, Cayo Vila, much-celebrated founder and CEO of the Vila Group and its impressive collection of hotels, airlines, businesses and whatever else took his fancy, richer than all manner of sins and a hundred times as ruthless, raised his head. Dru caught her breath.His jet black brows were low over the dark gold heat of his eyes. That fierce, uncompromising face made almost brutally sensual by his remarkable mouth that any number of pneumatic celebutantes swooned over daily was drawn into a thunderous expression that boded only ill. The shock of his full attention, the hit of it, that all these years of proximity had failed to temper or dissipate, ricocheted through her, as always. She hated that most of all.Her damnable weakness. The air seemed to sizzle, making the vast expanse of his office, all cold contemporary lines and sweeping glass that seemed to invite the English weather inside, seem small and tight around her. She could hear the lilt of Spanish flavor behind his words, hinting at his past and betraying the volatile temper he usually kept under tight control. Dru restrained a small ripple of sensation, very near a shiver, that snaked along her spine.They called him the Spanish Satan for a reason. She would like to call him far worse. "You heard me." The bravado felt good. Almost cleansing. He shook his head, dismissing her. "I don't have time for this," he said. "Whatever this is. Send me an email outlining your concerns and—"
"You do," she interrupted him. They both paused; perhaps both noting the fact that she had never dared interrupt him before. She smiled coolly at him as if she was unaware of his amazement at her temerity. "You do have time," she assured him. "I cleared this quarter hour on your schedule especially." A very tense moment passed much too slowly between them then, and he did not appear to so much as blink. And she felt the force of that attention, as if his gaze was a gas fire, burning hot and wild and charring her where she stood. "Is this your version of a negotiation, Miss Bennett? "His tone was as cool as hers, his midnight amber gaze far hotter. "Have I neglected your performance review this year? Have you taken it upon yourself to demand more money? Better benefits?" His voice was curt, clipped. That edge of sardonic displeasure with something darker, smokier, beneath. Behind her professional armor, Dru felt something catch. As if he could sense it, he smiled. "This is not a negotiation and I do not want a raise, or anything else," she said, matter-of-factly, wishing that after all this time, and what she now knew he'd done, she was immune to him and the wild pounding of her heart that particular smile elicited. "I don't even want a reference. This conversation is merely a courtesy." "If you imagine that you will be taking my secrets to any one of my competitors," he said in a casual, conversational tone that Dru knew him far too well to believe, "you should understand that if you try, I will dedicate my life to destroying you. In and out of the courts. Believe this, if nothing else." "I love nothing more than a good threat," she replied in the same tone, though she doubted very much that it made his stomach clench in reaction. "But it's quite unnecessary. I have no interest in the corporate world." His mouth moved into something too cynical to be another smile. "Name your price, Miss Bennett," he suggested, his voice like smoke and sin, and it was no wonder at all that so many hapless rivals went over all wide-eyed and entranced and gave him whatever it was he wanted almost the very moment he demanded it. He was like some kind of corporate snake charmer. But she wasn't one of his snakes, and she refused to dance to his tune, no matter how seductive. She'd been dancing for far too long, and this was where it ended. It had to. It would. "I have no price," she said with perfect honesty. Once—yesterday—he could have smiled at her and she'd have found a way to storm heaven for him. But that was yesterday. Today she could only marvel, if that was the word, at how naïve and gullible she'd been. At how well he'd played her. "Everyone has a price." And in his world, she knew, this was always true. Always. One more reason she wanted to escape it. Him. "I'm sorry, Mr. Vila," she said. She even shrugged. "I don't." Not anymore. Dominic was gone. She was no longer his sole support. And the invisible chains of emotion and longing that had ruled her for so long could no longer keep her here. Not now she'd discovered, entirely by accident, what Cayo truly thought of her. He only watched her now, those dark amber eyes moving over her like the touch of his hands, all fire and demand. She knew what he saw. She had crafted her corporate image specifically to appeal to his particular tastes; to acquiesce, as ever, to his preferences. She stood tall before his scrutiny, resisting the urge to fuss with her pencil skirt or the silk blouse she wore, both in the muted colors he preferred. She knew the deceptively simple twist that held her dark brown hair up was elegant; perfect. There was no bold jewelry that he might find 'distracting.' Her cosmetics were carefully applied, as always, to keep her looking fresh and neat and as if she hardly needed any at all; as if she simply possessed a perfect skin tone, attractively shaded lips, and bright eyes without effort. She had become so good at playing this role, at being precisely what he wanted. She'd done it for so long. She could do it in her sleep. She had. Dru could see the precise moment he realized that she was serious, that this wasn't merely a bargaining tactic she was trotting out as some kind of strategic attempt to get something from him. That she meant what she was saying, however impossible he found it to fathom. The impatience faded from his clever gaze and turned to something far more calculating—almost brooding. He lounged back against his massive, deliberately intimidating chair, propped his jaw on his hand, and treated herto the full force of that brilliant, impossible focus of his that made him such a devastating opponent. No was never a final answer, not to Cayo Vila. It was where he began. Where he came alive. And where she got off, this time. For good. She couldn't help the little flare of satisfaction she got from knowing that she would be the one thing he couldn't mogul his way into winning. Not anymore. Not ever again. "What is this?" he asked quietly, sounding perfectly reasonable, having obviously concluded that he could manipulate her better with a show of interest in what she might be feeling than the sort of offensive strategy he might otherwise employ. "Are you unhappy?" What a preposterous question. Dru let out a short laugh that clearly hit him the wrong way. In truth, she'd known it would. His eyes narrowed, seeming almost to glow with the temper that would only show there, she was well aware. He so rarely unleashed the full force of it. It normally only lurked about, beneath everything, like a dark promise no one wanted him to keep. "Of course I'm unhappy," she replied, keeping herself from rolling her eyes by the barest remaining shred of her once iron control. "I have no personal life. I have no life at all, in point of fact, and haven't for five years. I manage yours instead." "For which you are extraordinarily well paid," he pointed out. With bite. "I know you won't believe me," she said, almost pityingly, which made his eyes narrow even further, "and you will certainly never discover this on your own, God knows, but there is more to life than money." Again, that shrewd amber stare. "Is this about a man?" he asked in a voice she might have called something like disgruntled had it belonged to someone else. She laughed again, and told herself she couldn't hear the edge in it, that he should hit so close to a bitter truth she had no intention of acknowledging. "When do you imagine I would have the time to meet men?" she asked. "In between assignments and business trips? While busy sending farewell gifts to all of your ex-lovers?" "Ah," he said, in a tone that put her back right up, so condescending was it. "I understand now." His smile then was both patronizing and razor sharp. Dru felt it drag across her, clawing deep. "I suggest you take a week's holiday, Miss Bennett. Perhaps two. Find a beach and some warm bodies. Drink something potent and scratch the itch. As many times as necessary. You are of no use to me at all in this state." "That is a charming idea," Dru said, something dark and destructive churning inside of her, through lips that felt pale with rage, "and I appreciate the offer, naturally. But I am not you, Mr. Vila." She let everything she felt about him, all these years of longing and sacrifice, all the things she'd thought and hoped, all the foolish dreams she'd had no idea he'd crushed in their infancy until today, even that one complicated and emotional night in Cadiz three years ago they never discussed and never would, burn through her as she stared at him. "I do not scratch the itch with indiscriminate abandon, leaving masses in my wake, like some kind of oversexed Godzilla. I have standards." He blinked. He did not move a single other muscle and yet Dru had to order herself to stay in place, so powerfully did she feel the lash of his temper, the kick of those dark amber eyes as they bored into her. "Are you unwell?" he asked with soft menace, only the granite set of his jaw and the deepening of his accent hinting at his mounting fury. But Dru knew him. She knew the danger signs when she saw them. "Or have you taken complete leave of your senses?" "This is called honesty, Mr. Vila," she replied with a crispness that completely belied the alarms ringing wildly inside of her, screaming at her to run, to leave at once, to stop taunting him, for God's sake, as if that would prod him into being who she'd imagined he was! "I understand that it's not something you're familiar with, particularly not from me. But that's what happens when one is as carelessly domineering and impossible as you pride yourself on being. You are surrounded by an obsequious echo chamber of minions and acolytes, too afraid of you to speak the truth. I should know. I've been pretending to be one among them for years." I have one word for this book – WOW. 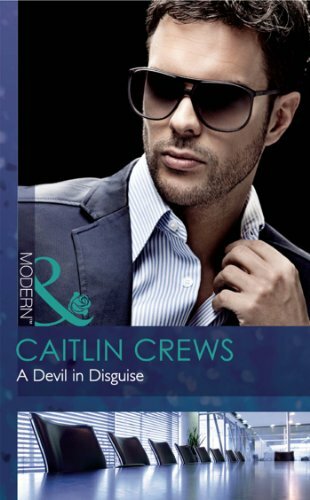 Caitlin Crews delivers yet another masterpiece in “A Devil in Disguise“, complete with the most selfish, stubborn, jaw-droppingly rude alpha male I’ve ever met in a M&B Modern book and a feisty, strong heroine determined to fight for her future, even if it means walking away from the man she loves. A gripping and memorable romance with beautifully created characters. An absolute must read!